To test software releases during the product development. To understand customer requirements and test plan from the test lead. 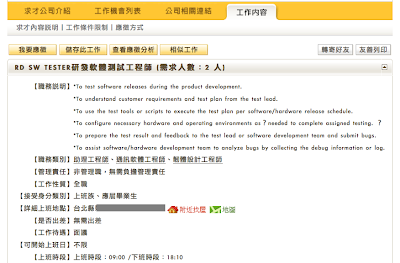 To use the test tools or scripts to execute the test plan per software/hardware release schedule. To prepare the test result and feedback to the test lead or software development team and submit bugs. To assist software/hardware development team to analyze bugs by collecting the debug information or log. I would like to introduce my book entitled "品質煉金術師之ＩＳＯ真經" (把品質管理理論用武俠小說方式表達) which published by 明文出版社 in 2006. I have posted in my blog at http://qualityalchemist.blogspot.com (please find in 標籤) and you are welcome to visit it.